All the nominees for the Best Original song at the 90th academy awards, made gains in the Billboard 200 Chart dated March 17th. The award was eventually won by ‘Remember Me’ from Coco, as the song, along with five other nominees, was performed by artists on live television. 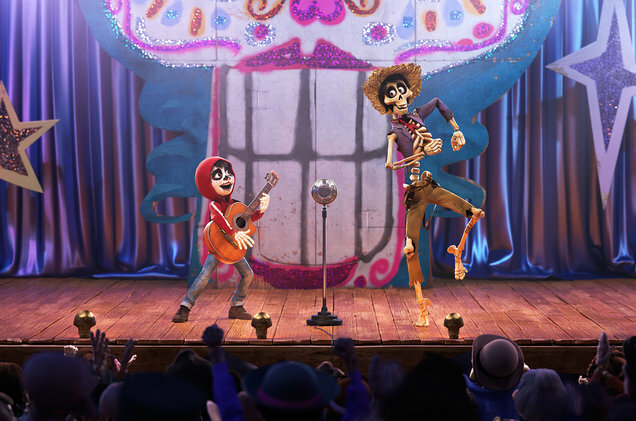 Different characters performed the song ‘Remember Me’ multiple times in in the movie titled Coco. The live performance at the Academy Awards saw the multiple renditions being performed in a medley, as Gael Garcia Bernal’s lullaby version was segued to Miguel’s version, which also featured Natalia Lafourcade. The movie also managed to win the Oscar for the best animated feature film. According to Nielsen Music, ‘Remember Me’ by Miguel did not sell the most, but was also the most streamed version of the song, with 1.58 million streams, in the week that ended March 8th. The song also was also present in the top 10 of the Kid Digital Song Sales chart that included three more songs from the movie. The track, featuring Lafourcade, is at No. 2 after seeing an uplift of 325 percent, with 4000 downloads sold in the week. The lullaby version of the song is at No. 5, up 276 percent with 3000 downloads. ‘Un Poco Loco’ by Anthony Gonzales and Garcia Bernal at No. 6 witnessed an increase of 129 percent with 2000 downloads, and ‘Proud Corazon’ by Gonzales has jumped from 21st to No. 9. Coco’s soundtrack also saw gains in the Soundtrack Chart, as an increase of 96 percent with 12,000 album units sold, saw it land at No. 4. The album also hit a new high at No. 39, climbing from No. 120 in the Billboard 200 Chart. This is the first time the album has breached the Top 40. Meanwhile, ‘This Is Me’ from ‘The Greatest Showman’ oversaw an increase of 11 percent in on-demand music streaming, with a whopping 6.83 million streams. The climb was no doubt aided by the singer Keala Settle’s stirring performance at the Oscars, as it climbed in the Billboard Hot 100 to 60th from the 87th spot. The album for ‘The Greatest Showman’ moved to No. 2 on the Billboard 200, as well as heads the charts of Top Album Sales. The third nominee ‘Mystery of Love’ by Sufjan Stevens landed the 13th spot from 47th in the Hot Rock Songs chart. The track from ‘Call Me By Your Name’ has managed to break into the Top 30 for the first time. The song was also No. 6 on the Alternative Digital Song Sales and No.8 on the Rock Digital Song Sales. ‘Visions of Gideon’ was the other composition by Stevens to feature in the film, and it debuts in the Hot Rock Songs at No. 43. ‘Mighty River’ by Mary J. Blige from the movie ‘Mudbound’, was No. 20 in the R&B Digital Song Sales with 3000 units sold. On the same chart, ‘Stand Up for Something’ by Andra Day from ‘Marshall’, is at No. 12 with 4000 units sold.